GRIP is pleased to announce the premiere of their new line of planograms designed to showcase camping gear and supplies at the Outdoor Retailer Summer Market happening at the Salt Palace Convention Center in Salt Lake City, UT. GRAND RAPIDS, Mich. - July 16, 2016 - PRLog -- GRIP is pleased to announce the premiere of their new line of planograms designed to showcase camping gear and supplies at the 2016 Outdoor Retailer Summer Market happening August 3-6, 2016 at the Salt Palace Convention Center in Salt Lake City, UT. The displays continue GRIP's history of hugely successful planograms and can be tailor-made to fulfill the needs of camping retail partners. The new displays can showcase GRIP's full range of camping gear and accessories, including 72 LED Light Bars, ideal for emergency roadside repairs, illuminating tents and campsites or as a multipurpose work light. "The outdoor and camping customer appreciates multipurpose accessories," says GRIP CEO Elias Amash. "In addition to their outdoor durability, many of our camping products can also be practical around the house or in the garage. Our camping line offers exceptional value to our retail partners by creating dedicated life-long customers." GRIP invites trade show attendees to meet them at Booth #PV3055. GET A "GRIP" ON YOUR CAMPING GEAR AND ACCESSORIES! About GRIP: GRIP was incorporated by Charles Amash in 1980 and has grown into a top North American supplier of camping gear and accessories, tools and general merchandise. 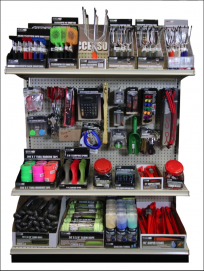 Located just south of Grand Rapids, Michigan, GRIP carries a product line of over 1,500 outdoor, camping items, specialty hand tools, household items, automotive, air tools, wood working, and general merchandise. With its proven track record of excellence in supplying retail clients with innovative products, timely fulfillment, and world class customer support, you can find the ideal solution to your camping accessory needs in GRIP.